January 2006 ~ Life after Thirty..
My Mum & Dads good friends Jilly & Roger are on a trip around Australia at the moment and, as they arrived in Sydney on Friday, we decided we should go out for Jillys Birthday.. 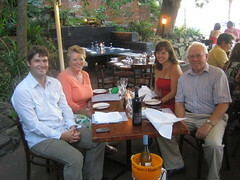 Anyway we all went to Le Kiosk which is a beautiful restaurant on our favourite beach, Shelley Beach! We all had a great time!! The food was gorgeous, and the wine was amazing!! It was really good to see my Godmother after all this time, and Me and Zee hope they have a great trip around Oz!! Its amazing what people can do!! Sunday was another sunbaking day.. All day on Shelley Beach, and in the evening I cooked a great Cassoulet for some friends. Then we went to the pub.. As we went to Cerutis, Zena thought she knew the person on the door. He said he used to be in Home and Away, and straight away Zena was, "Oh My God.. Its Blake!!" Thanks to the Digg Effect .. I have decided to open a WordPress blog. I have my Typepad blog, My Livejournal account, and I tried Blogger (but hated it).. But WordPress is getting loads of reviews right now.. and I thought I would see if its worth having!! Anyone going to Comment?? I doubt it..
Me and Zena were invited to a James Bond Party on Sunday. One of Danni's friends 30th (i think...) Anyway we were discusing what to go as... I wanted to go as Felix Leiter (James Bonds CIA contact), but he had his arm and leg bitten off.. then it was Jack Wade (another CIA guy), who wears Hawaiian Shirts and a Panama Hat.. but we couldn't find a cheap Panama anywhere. Then I had this idea to go as underwater James Bond.. I had the mask.. I had the boardies... I need a rash vest and a knife, as well as an underwater breather!! Rash vests were too expensive, so I used my Thermal from Snowboarding which looked similar, and made the knife from Cardboard and Tinfoil..
Zena had the best idea though... Miss Money Penny!! See us here! So instead of going to the beach on Sunday, we decided to do the Manly-Spit Bridge Scenic Walk. Its about 9.5km and a great way for a little exercise. It was a beautiful day, and I took my little Canon and Zee her 35mm, and we took loads of photos!! Had loads of fun..
Oh yeah as I was looking for a link for the walk, found this guy. 91 years old, and hes walked every street in every suburb in Sydney and a photo to prove it! !As 7 News says, "Australia's Forrest Gump"
I am more likely to email a joke, but this Blond Joke is the best!! So whats everyones New Years resolutions? I have decided this year just to carry on my thirtieth birthday resolutions.. I am doing OK on most of these.. I am saving for our trip around Oz and the USA, and also I haven't smoked in ages!! My Blog is getting better and better (IMHO), but the one that is letting me down is getting fit. I have to. I want to get rid of my fat belly! Zena got me a surf lesson for christmas, and I am going to get it cracked, but I need to be fitter!! I started running in November, and I have been on and off... from now on its at least 4 times a week. The bookies are taking bets now... 2/1 fail by February.. 1/4 keep going forever..
P.S monthly email has been sent.. lets see some replies or comments please!! its good to hear whats happening back home! I spent part of the night on Little Manly beach watching Sydneys New Year Fireworks at 9 o'clock, and then we all went to Manly Beach for New Year proper!...I hope you all enjoyed your cold one in UK!! New Years day bought the second hottest day in Sydneys recorded history, 44c.. it was so hot, that some of the most ferocious bushfires have been raging just north of Sydney. We spent a few hours on the beach, but had to get back in once the sandflys annoyed us too much.. Anyway New Years Resolutions.. Have you made any?? I am just gonna stick to the ones I made when I turned 30.. also lose my fat belly! Also want to get a really great job this year too... Let me know what you guys are going to do! !